Explore the world of English vocabulary. The Kitchn can’t live without it. Chow hails it. Gourmet mag pays tribute to it. If you are an English-speaking foodie, there is no way you have not heard about it. Microplane. The career of this piece of kitchen gadgetry began in the early 1990s with a Canadian woman’s frustration with the poor performance of her box grater. Fed up with the inability to properly zest oranges needed to make a cake, she dropped her kitchen tool into a bin, and reached for her husband’s rasp instead. The woodworking tool worked like a charm, bringing finely grated zest with virtually no effort. The rest is history. Nowadays, Microplane manufactures a whole range of graters and zesters AND woodworking tools. 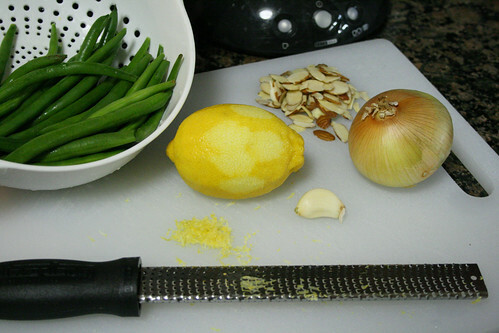 Microplanes are used to grate and zest everything from cinnamon and citruses to cabbage. Their secret lies in chemically-processed surface which makes it extra sharp, as opposed to dull teeth of traditional graters. Microplanes are available in two shapes: the long and thin (looking just like a wood rasp) and short and wide, not to mention the numerous shaving surfaces: fine for turning whole spices into powder, coarse for tiny specks of parmesan, extra coarse and ribbon for slivers of carrot, and shavers for big chunks of chocolate. Add to this being dishwasher-safe and you have a recipe for a mind-blowing success. Note: The word “microplane” has many uses. I got a grater made by Microplane. I’ve got an Oxo micloplane. London is the capital of England and the United Kingdom. It has more than 7 million inhabitants and covers an area of around 1.500 square kilometres. It attracts millions of visitors each year, as it abounds in numerous interesting places to see: historical monuments, royal palaces, art galleries, and museums. London’s West End, the city’s culture and entertainment centre, is many tourists’ favourite district. If you want to see a movie, a theatrical play, or a musical, this is the place to be. The metropolis consists of 32 boroughs plus the City of London: the oldest part of the city and its main financial district. It is governed by the Mayor, chosen by the Londoners in local election held every 4 years. Currently, the post is occupied by Boris Johnson from the Conservative Party. London is also the centre of British politics. It hosts the British Parliament, located at the Palace of Westminster. London is a truly multicultural city. For many years, it has been a destination point for thousands of immigrants. You can meet people of all races and religions there. Around 40% of the inhabitants belong to an ethnic minority group, the most prominent being South Asian and Black African. The part of London especially famous for its cultural diversity is East End. The city is a place that you can’t resist. Hollywood filmmakers know this really well and often choose London as a filming location. It is featured in many well known films, such as Notting Hill, Four Weddings and a Funeral, My Fair Lady, Match Point, and 101 Dalmatians. What is more, it is the location of Britain’s favourite soap opera: EastEnders. Have you ever wondered why F and J keys on your keyboard have raised bars or dots on them? The answer is: touch typing. Touch typing means using computer keyboard without looking at it. Once mastered, it greatly increases one's typing speed. You no longer have to look for keys you want to press. Your brains does the work for you. How is that possible? Muscle memory, baby. It allows people to perform movements automatically, without thinking about them. In the case of touch typing your brain remembers where certain keys are located on the keyboard. Thanks to this, expert typists reach the typing speed of over 100 WPM (words per minute)! There is only one way to learn touch typing: practice, practice, practice. The more you practice, the easier it is for you to type. There is a lot of free software allowing to learn how to touch type. You may also buy a special keyboard with blank keys that speeds up the learning process. Learning can be frustrating at times, but it's worth it. In English there are plenty of acronyms - words made up from the first letters of other words. Acronyms are cool, because they allow you to say things faster. However, they may give you a headache, if you've never came across them before. 'Gość z "Terminatora"' zgarnięty za jazdę po pijaku. Kobieta z North Middleton dała narkotyki mężczyźnie który przedawkował. Brak recepty na przeciążenie izb przyjęć. W tej części serwisu znajdziecie multum znakomitych przepisów na dania z grila z całego świata. Dyrektor generalny Bank of America bez wypłaty. Coraz więcej zachorowań na choroby weneryczne wśród osób w średnim (i późnym) wieku. Producenci samochodów oferują to, co jeszcze kilka lat temu wydawało się nie do pomyślenia - średnie samochody i terenówki o mocy, wydajności i wielkości, jakich oczekują Amerykanie, a do tego ze zmniejszonym zużyciem paliwa. Najlepsza przyjaciółka Jessiki Simpson rezygnuje z bycia jej asystentką. Wojna z opłatami za korzystanie z bankomatów. Otwórz okno zamiast włączać klimatyzację.